Typical approaches of using OTL in real life, not just message exchange, as it is in most examples. OTL is great thing for Delphi world, but for now it too hard-to-start thing, due to wide range of mistakes you can make using it. How to send and receive JSON data via HTTP requests in the background effectively while even providing user feedback. In addition to the four topics in Q1 (which are somewhat inter-related and all of interest to some degree), how about: “Multithreading in mobile applications" ? Like I've been wondering that your libs come with SpinLock inplementation, is it worth it on new OS or is it better in some case that Critical Section. I've seen also code of using WaitMultipleObjects, but never looked into it (looked smart way to solve things). Precision which components from the VCL, that should not be accessed from threads (without synchronizing). Debuging all multithread conditions. I.E. Race Conditions, Deadlocks, etc. Writing DLLs that are called from multiple threads of a calling application. Using threads in a DLL that is called from multiple threads of a calling application. How to determine which type of multithreading to use. Please spend time differentiating the examples from each other. - how to use threads to run queries on database servers (especially Oracle) faster (for example queries on partitioned tables). I have used Oracle RDBMS pipes with well-tuned SQL statements so far but I am looking for alternatives on the client side. 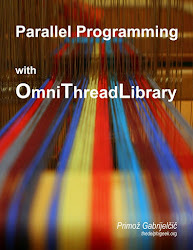 Best practices for how to use OmniThreadLibrary. How does OmniThread Library compare / relate to other frameworks like in .net / C#? It would be good to see how things are done in e.g. .net/ C# and show similarities and differences with OmniThread Libraries. One item that comes to mind, is the "await / async" feature that you once explained on your blog. So more of those comparisons would be helpful.